By guest blogger Lisa A. White. Photos Copyright © Lisa A. White. WE ARRIVED AT Shannon Airport, knowing that we were not going to even try to see “everything” Ireland has to offer. Our top priorities included seeing the countryside and hearing some traditional Irish music. 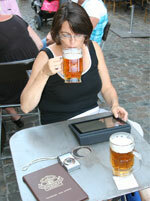 After that, cheese, porridge, beer, hiking, and bicycling made the list in no particular order. Cities and historic sites, for the most part, were second fiddle on this particular trip. Picking up the rental car, we learned a couple of important things. First, even when your daily car rental rate is wonderful, the insurance for that car is over quadruple that price. Buyer beware. Second, if you are from the US, prepare to drive on the “wrong” side of the road, on the “wrong” side of the car, with the stick shift on the “wrong” side of your body. If you’re anything like me, after a few days you will totally forget which is wrong and which is right, which leads to total confusion and potential chaos. Driving is no big deal, but turning is. Dan, my husband and trusty navigator, spent the entire trip reciting his mantra of “hang tight” at every left and “swing wide” at every right. One problem with this driving on the left thing in Ireland: many of these tiny roads are only one car wide. 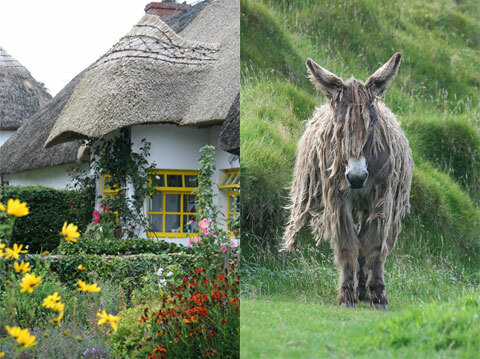 From Shannon, we wandered south toward the Dingle Peninsula through the village of Adare, which has beautiful thatched cottage shops. Seeing the artwork of the thatching makes me want to see a thatched roof being replaced–that goal will have to wait. We did not stay long, but passing through is mandatory if you can. Our destination was the small town of Dingle where we planned to spend a few nights at Browne’s B&B. John and Camilla Browne were both born and raised on the south-western peninsulas of Ireland, but John is truly a Dingle local. He shares all sorts of fun information about the local pubs–including one called Foxy John’s which doubles as a hardware store for those days when a box of nails is not all you need. Camilla is the purveyor of the maps and sites, not to mention an incredible cook. John is the bicycle route director–and p.s. they rent bicycles too. At Browne’s, the B for breakfast ought to be in bold, caps, italics, and a font size much larger than the rest. Don’t skip the porridge (with or without Irish cream), and the simple-sounding fruit and cheese plate is anything but simple. The cheeses are local, varied, and wonderful. Camilla’s traditional Irish breakfast is exceptional–try the black and white puddings (so long as you are not vegetarian, in which case you should not even research them). Our days started on a full and happy stomach, followed by wandering and hiking. At Camilla’s advice, we hiked up to Eask Tower, just a short drive from their B&B. Eask Tower is a lighthouse minus the light, and later became a World War II lookout. It is not a difficult hike but you are guaranteed to end up with sheep poo on your boots and plenty of panoramic coastal photos on your camera. What a view! Later the same day, also at Camilla’s suggestion, we took a ferry to Great Blasket Island. If you are looking for shopping (which we weren’t), don’t go there. Money has no use on this particular island. Take your lunch and enjoy the natural beauty, the ruins of the small village which became uninhabited in 1953 when the government moved the last twenty-two residents to the mainland. The sheep are nice, but I fell in love with Marley, a long-haired Poitou donkey who lives with a few friends on Great Balsket. I doubt that Marley is really his name but there was no one to ask. We hiked around part of the island, up to the top, and found the ruins of what might have been a church. 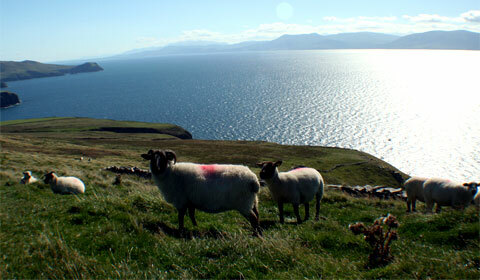 We managed to go to Great Blasket on a beautiful sunny day so the view of the mainland and other islands was incredible. 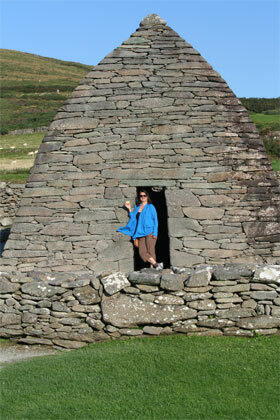 Another favorite adventure was Gallarus Oratory. Several people warned us the entrance fee through the visitors’ center is fairly steep, but if you drove past that entrance, a “free car park” is just down the road. Always ones to save a euro or two, we drove past. Soon after was a small (yes, small as in Irish small) drive on the left. Being the fearless driver, I pulled in. The tiny road became so narrow that the rock walls on either side were easily touchable. Tears of laughter rolled down our faces as we envisioned crawling out the windows at our free car park. As the grass grew taller, Dan pulled out the euros. We carefully backed out. Glancing just a little past the tiny overgrown road, however, was the beautiful, intentional, and totally free car park and a flower-lined path to Gallarus Oratory, an incredible upside-down, boat-shaped chapel that was built in about 700 or 800 a.d. without mortar. Our evenings, of course, were spent in the local pubs listening to a variety of musicians playing traditional music. In Dingle, we bounced around from pub to pub. I am not sure we had a favorite one there. We liked the humor in one more, the music in another, the setting in a third, and the beer in them all. I am not typically a beer drinker in the US, but in Ireland, yes! Suffice it to say that we had fun, and made it back to Brownes’ B&B safely. We walked from town although some may want to catch a cab rather than choosing to drink and drive OR drink and walk on Irish roads. In Part 2 of Rural Irish Wandering and Music, we wander to Doolin, the Aran Islands, the Cliffs of Moher–with more emphasis on the incredible traditional music than I have included in Part 1. Stay tuned . . .
Lisa White has wandered through world like she has wandered through professions. In both pursuits, she always has more to explore, more to learn, and more to do. Currently she practices law in the area of dependency and neglect as well as other cases that address the well-being of children. Often this is an area of law that feels exceptionally “heavy.” When it becomes too emotionally burdensome, she catches a flight somewhere–anywhere–to remember the good, positive, beautiful, tasty, and fun of the world. A very nice start to a wonderful article. Ireland is a place that has been calling me for years. I haven’t made it yet, but it is on my very long bucket list. This article is bringing it to the top of said list again..
For as long as I can remember, I’ve had this dream of visiting Ireland, and your article has made me want to even more! Estrella, I hate to admit it but I think I have finally recovered enough to say this out loud. The driving adventure was actually much worse. On the first day, after several hours of diligent and cautious driving, Dan and I were talking as I turned left onto a country road. We came around a wide curve and suddenly a car was in OUR lane. Later we compared thoughts. For each of us, our first thought was, “What is that old lady doing in our lane? ?” She wasn’t. Luckily (which is a gross understatement), she was going slow, we were going slow, and we both slammed on our brakes. We stopped nose-to-nose. Only her license plate cover was broken. We learned quickly that Irish “guardies” are nice fellows, Irish elderly women are practical, and most important: I can NEVER make a turn without a huge amount of consternation and fear. Thank goodness we didn’t meet another mixed up American on the roads!